The formation of a new nitrogen fertilizer powerhouse had these two stocks moving in opposite directions last month. 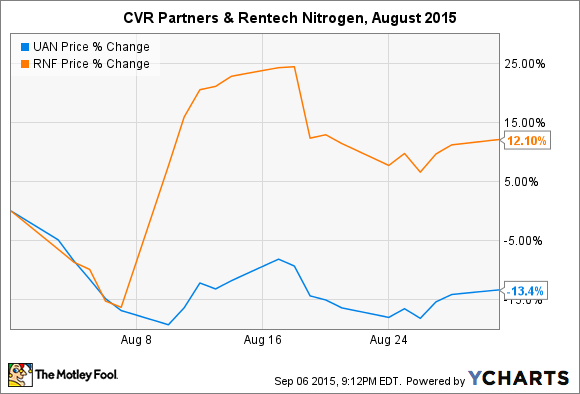 What: Shares of CVR Partners LP (NYSE:UAN) sank 13% in August after the company acquired its nitrogen-producing peer Rentech Nitrogen Partners LP (UNKNOWN:RNF.DL) for $533 million. Shareholders of the latter are celebrating a bit more after enjoying a 12% gain in the same period. They're also about to receive $2.57 in cash per share and 1.04 shares of CVR Partners for every share of Rentech Nitrogen they own. You know what they say: There are two sides to every coin. Of course, looks can be deceiving. While CVR Partners LP stock declined, it will sport a market cap of roughly $1.3 billion when the acquisition closes -- a nearly 60% increase over recent levels. The company also avoided the headache of Rentech Nitrogen Partners' beleaguered Pasadena, Texas, facility, which was excluded from the acquisition and will be sold separately. So what: CVR Partners LP shareholders will have to stomach an additional 40.5 million shares -- an increase of nearly 55% -- and Rentech Nitrogen Partners' net debt of roughly $301 million. Investors will gain diversity of operations (CVR Partners owned a single facility before the acquisition) and the potential to grow the top and bottom lines after both companies execute expense-slashing facility upgrades. CVR Partners CEO Mark Pytosh said he expects the acquisition to allow double-digit growth to quarterly cash distributions, which will increase further once an estimated $12 million in synergies are realized. But tainting a relatively healthy balance sheet may be a steep price to pay in the end. After all, Rentech Nitrogen Partners ended the second quarter of this year with more debt than assets. Now what: The combined company will become the second-largest U.S.-based manufacturer of urea ammonium nitrate, or UAN, which is a higher-value nitrogen product than ammonia. That's good news, as is the long-awaited arrival of diversity in operations for CVR Partners shareholders, who gain a facility in a new geography that uses different inputs that can still target nitrogen-hungry farmers in the Corn Belt. However, given the challenging markets facing fertilizer manufacturers at the moment and the monstrous amount of debt taken on, I'll be sticking to the sidelines.